This begs the question: how has an “imaginary and national” Zulu identity been conceived of in the digital realm? Zulu ethnic identity is no longer relegated to the analog world. It has moved into the digital realm and historians must take heed if they are to stay apace of the rapid developments rendered by this new medium. There are three main forums that are the focus of this essay, namely (1) Zulu language resources online, (2) expressions of ubuZulu bethu on social media, and (3) digital archives centered in the KwaZulu-Natal province. In examining these three spaces of digital engagement, my argument is twofold: (1) there is an “imagined” digital Zulu community (many of them, in fact) and (2) given this reality, historians must realize that contemporary Zulu identity discourse is inherently wrapped up in the digital, necessitating a shift in perspective for historians hoping to chart the contemporary manifestations of this centuries old debate. Language is fundamental to not only ethnic or cultural identity, but also personal identity. On a broader scale, scholars like Anderson have found that language is fundamental to the idea of the nation. “What the eye is to the lover —that particular, ordinary eye he or she is born with—language—whatever language history has made his or her mother-tongue — is to the patriot,” Anderson theorizes, “Through that language, encountered at mother’s knee and parted with only at the grave, pasts are restored, fellowships are imagined, and futures dreamed.” In the African context, Ngugi wa Thiong’o’s reminds us that language has a “dual character: it is both a means of communication and a carrier of culture.” Culture is directly linked to, and in wa Thiongo’s perspective, created by language, since language carries “the entire body of values by which we come to perceive ourselves and our place in the world.” Zulu nationalism, whether cultural, political, or ethnic, revolves around isiZulu as a basis for the imagined connections that form these communities. This is true as much in the digital realm as in the analog. South Africans’ relationship with language, a single language at least, is complicated when considered in a South African context. For the South African nation, pinning down one single language as the foundation of the imagined nation is impossible, given the recognition of 11 national languages in the country’s first democratic constitution. Zulu does hold a unique position in South Africa though, as a 2011 Census showed, since nearly a quarter of the population, according to a 2011 census, report isiZulu as the first language spoken at home, followed by isiXhosa (16%) and Afrikaans (13.5%). Mark Turin, an anthropologist, made a point to establish South Africa as a polyglot nation. Observing proceedings at Parliament, Turin was surprised to find that although most there were transcribers for each of the nation’s official languages, the majority of discourse in Parliament was conducted in Zulu. This statistic, while telling of Zulu’s position of position, may obfuscate as much as it hides, since most South Africans report fluency in five or six of the eleven national languages, usually citing several African indigenous languages in addition to English and/or Afrikaans. Of course, this statistic obfuscates some of the subtleties of language adoption and adaptation in South Africa, as Jacob Dlamini illustrated in Native Nostalgia (2012). Afrikaans, Dlamini points out, is “the language in which most colloquial expressions are given form” by black South Africans. No matter the complicated politics at play, language clearly has had a key role to play in the proliferation of Zuluness in digital spaces. While Zulu nationalism may use isiZulu as a cornerstone of its digital manifestations, the Zulu language has been slow to adapt to the technological revolution. Most technical and/or technological terms in Zulu are adapted directly from the English. For example, the Internet is typically expressed as i-Internet, using the traditional class 11 prefix used for foreign terms. This does not make Zulu unique in this sense; in fact, in Ngugi wa Thiong’o’s reflections on his own knowledge of Gikuyu, the adoption of English terms for new technologies, it is clear that this is widespread phenomenon. wa Thiongo explains that this syntax further exoticizes these terms. This may in part explain why technology appears to us as slightly external, their product and not ours. The word ‘missile’ used to hold an alien far-away sound until I recently learnt its equivalent in Gikuyu, ngurukuhi, and it made me apprehend it differently. Learning, for a colonial child, became a cerebral activity and not an emotionally felt experience. In order to develop these new terms, Mbuyazi first wrote a novel in English, entitled The Adventures of the Wiby Kids, and then translated this text into a Zulu version, entitled Amayiphendleya, spending considerable time figuring out inventive ways to develop Zulu terms that would evoke emotions beyond their literal meanings. In Amayiphendleya: Isiqalo Sakho Konke, one of the first new terms Mbuyazi worked to develop an expression for was “air conditioner”. The word Mbuyazi developed for “air conditioner” was isiloloongamoya, loosely translated as “a machine that trains the air.” Mbuyazi also carefully considered how to develop terminology for the planets. While in Zulu there is a word for the Earth, umhlaba, he struggled to find ways to express the existence of other planets in the solar system. Eventually, he settled on the term umzulwane, explaining, “fi you observe the movement of the planets, they appear to hover around the sun, which is why I named them umzulane which means going round. 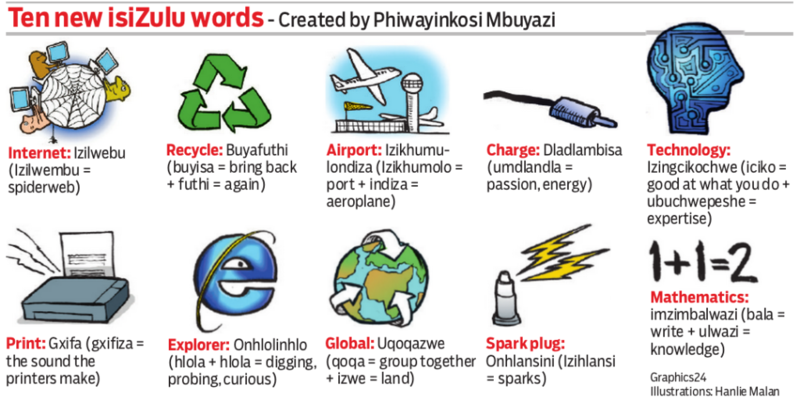 This shows the connection between the new word and its English translation.” All told, Mbuyazi developed over 400 new Zulu words related to science and technology, using pre-existing Zulu idioms to express these foreign terms. Mbuyazi’s mission can be compared to the recent push for the translation of texts like the Quran and the Bible into Zulu from their original languages, not the translation of English versions into Zulu. This project will require years of language training not only in different Zulu dialects, but also in the original languages that these texts were composed in. Bishop Mlungisi Dlungwane rationalized this ambitious project saying, “We need a Zulu version that’s not translated from a translation.” The project’s director, Father Alexis Madela, agreed with Dlungwane’s justification, explaining that this “new version will attempt to capture the culture and the context in which the original version was written. Also there are more than 90 versions of the English Bible, so it’s only right that Zulu speakers have the same right to choose.” This project is gaining support from the highest levels of Zulu society, including a R500 000 donation from President Zuma’s own foundation. These projects, both Mbuyazi’s purposeful evolution of Zulu and the mission to render the Bible as a truly Zulu text, show both the fluidity of the language and its importance in relaying both meaning and expressions of Zulu cultural identity. Language has been key in the proliferation of Zuluness in digital spaces. In his research on the use of Afrikaans in digital spaces, Herman Wasserman found that the construction of websites solely in this language not only “create[s] the opportunity for an affirmation or re-iteration of existing cultural identities, it also sets the platform for the re-imagining of these identities,” in addition to providing “a tool for Afrikaans speakers to reposition themselves within a changing linguistic landscape, indicat[ing] the potential the Internet has as a platform for linguistic minorities.” While Wasserman did address the presence of indigenous African languages on the Internet, a lot has changed since his 2002 study, with major gains being made in the linguistic landscape for African indigenous languages online, specifically in the proliferation of Zulu online. One of the earliest resources to be launched was Isizulu.net, a virtual dictionary and grammatical reference founded in 2003 by a German student who first started the site to meet their own needs in learning Zulu. Zulu is also available on several online language resources, including Lexilogos. For those interested in a more interactive learning experience, the University of South Africa (UNISA) has launched a free introductory-level Zulu course (along with Northern and Southern Sotho, Tswana, and Xhosa). Zulu has also been incorporated into larger digital language projects, illustrating the perceived importance of this language, most likely due to the 10.2 million native speakers and over 16 million non-native speakers living worldwide. In December 2013, Google announced the addition of addition of Hausa, Igbo, Yoruba, Somali, and Zulu to Google Translate, following this advancement with the inclusion of Zulu to the Gmail system just a year later. This translation tool is by no means perfect; one reviewer tested the system finding that it failed to meet seven out of eight tests presented. This, however, may be a symptom of the complexity of the language, as the algorithm seems to “struggle with the literal nature of Zulu” as well as the language’s many idiomatic intricacies. The main problem with all of these language resources is that they are completely conceived, developed, and operated by non-native speakers (save, perhaps, for the UNISA project). While Google does invite its users to help them “improve this translation”, there is no doubt that non-native speakers are the main users and collaborators on these projects. An interesting study done by an independent blogger, Johann du Toit, found that 1930 domains based on Zulu words had been registered worldwide as of December 2014. Only 24 of these domains had been registered in South Africa, with over 650 registered in the United States. What does this tell us about the global reach of the Zulu language, given the limited numbers of Zulu speakers located in the United States? While language may be one of the key markers of nationalism, the Zulu language resources online are less an indicator of the role of linguistic similarity in fomenting imagined linkages and more an indicator of the appeal of Zulu as a subject of study. This same trend can be seen in project intended to promote the study and preservation of Zulu history online. Social media is not the only digital format that facilitates the solidification of imagined virtual communities. Some scholars have argued that digital archives also serve a purpose in solidifying both national and ethnic identities. Rebecca Kahn and Simon Tanner in African Studies in the Digital Age: DisConnects(2014) argue that digital archives serve as centers for the formation and presentation of national identities. Digital collections do indeed act as simulacra of national identities. These identities, fragmented and contested as they may be, are constituted through the collective memories that are stored in memory institutions like libraries and museums. In the material world, these identities are constructed through the porous archival processes of collection development. This is mirrored in the creation of online collections. These collections are used as tools to convey particular messages to an unbounded audience. The implication of this porous, susceptible process, which allows for the revisioning of identity via digitization, is complex and invigorating. The lion’s share of digitized materials related to Zulu history has come in the form of oral histories. Oral histories have been a major focus for the reconstruction of histories in KZN, in particular. The major analog centers for oral historical research, in addition to the central repositories, are the Killie Campbell Africana Library Oral History Project and the Sinomlando Centre for Oral History and Memory Work at UKZN-Pietermaritzburg. Neither of these projects, however, offers access to these materials through an open-access model. There are, however, a couple of digital repositories focused on Zulu oral histories. The “Forgotten Voices” in the Present: Alternative, Post-1994 Oral Histories with Three Poor Communities in South Africa, part of the broader African Oral Narratives project, contains 55 interviews with residents of Maandagshoek, Rammolutsi, and Sebokeng, this project includes a separate page for each interview, including important details like a biography of the interviewee, full audio clips of the interviews, transcripts in the original language, and translations into English. 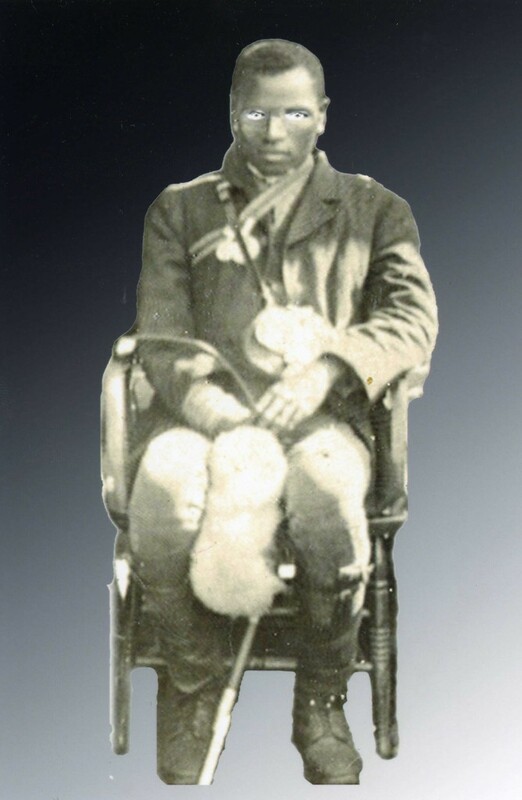 The Inanda Seminary Oral History Project, collected and presented by historian Meghan Healy-Clancy, preserves the memories of students and faculty associated with Inanda Seminary, the women’s educational institution located just outside of Durban, in English language transcripts. Both of these examples have been produced by Western scholars, raising questions about the ownership of knowledge and the role of stakeholders in producing materials that shape how others might understand their community, clan, ethnicity, and province’s histories. 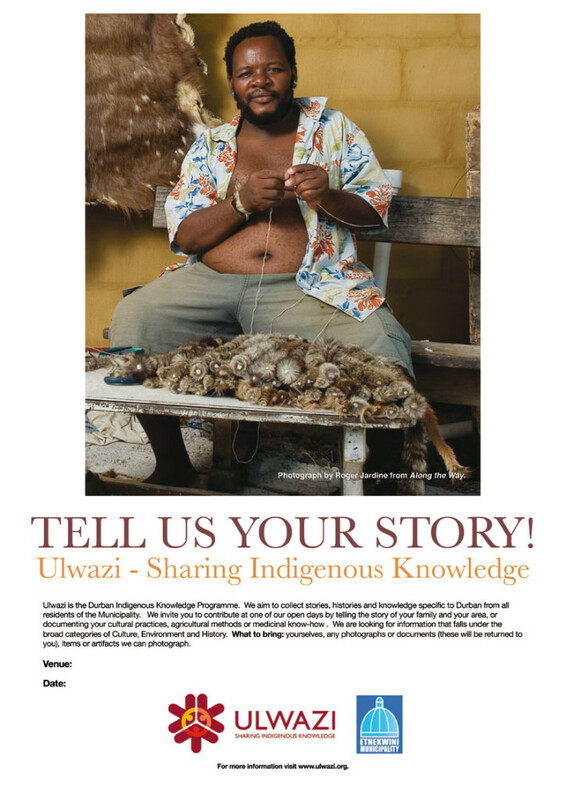 One project that is attempting to place the ownership of Zulu knowledge online squarely in the hands of local stakeholders is the Ulwazi Programme. An initiative funded by the eThekwini (Durban) Municipality and built in conjunction with the Durban public libraries, the Ulwazi Programme aims to address the “paucity of African stories and community information on the web” through the construction and maintenance of a wiki developed through collaboration with local community members. By charging volunteers to gather sources and create content for the wiki, the project offers “opportunities for traditionally marginalised groups to record and share their local knowledge and histories on the Internet, from their perspectives.” The program utilizes fieldworkers from the communities to help gather information at the local level, recruiting “younger people from the community with some measure of ICT skills – often with better mobile skills than PC skills – and a keenness to develop new skills” who have “an intimate knowledge of the community and are in a position to build up trust relationships with members of the community.” The Programme incentivizes volunteer participation, offering airtime to the volunteer fieldworkers as compensation for their time and expertise. In terms of the actual content on the wiki, currently there are 791 user-generated articles, 356 of which are written in Zulu, organized into over 175 sub-categories within three main categories: Environment, Culture, and History. The project has also produced several taped oral history interviews and brief documentaries that are available on Vimeo, like the interview with Thulasizwe Goba below. According to usage statistics, the wiki attracts readership from throughout South Africa, mainly Durban and the cities in the Gauteng Province, and acts as an important reference for both local and international readers aiming to learn more about Zulu life and culture. User searches focus mainly on Zulu terms, with the top search terms including “umemulo (a traditional 21st birthday celebration), umembeso (a type of traditional clothing), izaga (Zulu proverbs), izinganekwane (traditional folk tales), umbondo (a traditional marriage agreement), umhlonyane (a puberty ceremony for females), impepho (a spiritual herb) and izithakazelo (clan names).” Niall McNulty points out that these search tersm are all in Zulu, indicating “a desire for but lack of language content online.” The search trends on the wiki are fascinating, especially given the wide readership outside of KZN itself. However, the Ulwazi’s Programme intentional self-branding as the new digital custodian of Zulu history and culture is concerning, especially when taken into account the heavy editorializing that happens before articles make their way to the wiki, in addition to the role of political figures in the production process. For example, Siyabonga Mkhize (who will be discussed more fully in the next section) contributed content on the Mkhize and Mbo, groups to which he belongs and dedicates his life to restoring to their rightful place. And, again, the main control of the site lays not in the hands of local community members, but rather with white South Africans who pick and choose the individuals and stories to be presented on the blog. With that being said, while the content on this site is fascinating, by far the most interesting Zulu language debate is occurring not in these educational forums, but rather on social media. Zulu-speakers on Facebook, Twitter, and Instagram are adapting these forums to their own needs, far beyond any level of custodianship. [A state of mind] where the “nation” operates outside the borders of modern nation states in Africa and its continental and conceptual boundaries. So, yes, the blog announces that Africa is indeed a “country,” an imagined community whose “citizens” must reinvent the narrative and visual economy of Africa. Facebook and Instagram, though less studied as ideal digital imagined communities due to their more stringent privacy restrictions, also function as spaces for the solidification of networks of people with shared characteristics, camaraderie, interests, and, most importantly language. In 2014, Portland Communications, a consultancy firm focused on “strategic communications for the digital age,” published the second of two studies focused on “How Africa Tweets,” tracking the frequency, content, and linguistic trends of the continent’s social media use. The 2014 study found that aside from English, Arabic, and French, Zulu was the most commonly used language in the 11.5 million African tweets collected. Johannesburg, in particular, represented the greatest number of tweets on the continent as a whole, with 344,215 geo-located tweets posted between October and December 2013 (which does not take into account the number of tweets with geo-location turned off). Of those 344,215 tweets, the greatest percentages of non-English tweets were written in Zulu. This macro-level analysis approach to understanding how Zulu speakers engage on this social media forum is useful for conceptualizing the role of Zulu language on social media in general, but what about at the micro-level? How is a Zulu identity being debated and presented on social media, not only in Zulu but also in English? How do prominent figures and organizations, in addition to everyday citizens, use Zulu at different times for different purposes? In many ways, social media has been used similarly to the ways that print capitalism was used in the nineteenth and twentieth centuries to crystallize nationalist sentiment and foster the formation of imagined communities. Just like political leaders in the past would turn to newspaper articles, magazine features, or TV interviews to get their point of view to their constituents, now Zulu politicians can instead turn to social media for an immediate point of access to their desired audiences. Mangosuthu Buthelezi (@Gatsha2013), the figurehead of the Zulu nationalist Inkatha Freedom Party (IFP), maintains a presence on Facebook and Twitter, using these forums as a way to publicize events and initiatives. Although IFP is a Zulu nationalist group, Buthelezi’s tweets are mainly in English posing interesting questions about the perceived audience of these messages. See drugs makes ppl go crazy –> RT@SethMbhele: Gatsha Buthelezi needs to go to the Hague for his crimes against humanity. Yeah, I said it. The most powerful Zulu politician in the country, Jacob Zuma, tweets almost exclusively in English (understandably so since he is the current President of South Africa), from time to time he does switch to other languages when addressing certain constituencies. I'm off to PE, the friendly city, will spend the whole day with the friendly people of ibhayi elembathwa ngabalaziyo! Other groups, including fringe clans searching for legitimacy, turn to social media as a way to publicize their cause. The Inkosi Tilongo Foundation on Facebook, for example, uses this social media network as a platform to promote the visibility of the Mbo people through the iconography of the former chief (inkosi) Tilonog kaNgunezi. Siyabonga Mkhize, the founder of the Inkosi Tilongo Foundation, has also taken to different blogging platforms to bring attention to the Mbo clan and its leader, Chief Tilongo. In the political sense, the use of social media is a logical continuation of how negotiations over Zuluness at the highest level used to be debated through the press. Grant McNulty has argued that the use of social media by politicians separate from the IFP, which controlled so much of KZN politics in the 1970s and 1980s, holds the potential for further democraticizing politics in the region. Digital spaces, McNulty argues, have “begun to illuminate something of the ways in which tradition and custom are political resources and how exertion of custodianship over these bodies of knowledge is pertinent to the operations of power in KwaZulu-Natal, and a contested source of that power between amakhosi and government.” While these power dynamics are fascinating, perhaps the use of digital spaces by everyday Zulu speakers, who use social media as much for their own personal interests as they do for any political or cultural goals is more fascinating and productive for considering contemporary manifestations of Zuluness online. Given that Twitter does not allow users to search for tweets specifically in isiZulu (and the fact that this might be a useless exercise since many users tweet in Zulu and English simultaneously), it is incredibly difficult to gauge the proliferation of the Zulu language in tweets without specific, focused search terms, users, and geographic parameters. Searches for broad hashtags like “#zulu” and “#isizulu” return a wide range of content, with users commenting on their cultural heritage, their language trends, the recent xenophobic attacks in the KwaZulu-Natal province, the latest developments on their favorite Zulu-language soapies (like Isibaya), and a range of completely random subjects and topics. With #Zuma s #Zulu dominated #ANC Govt & an inciteful king #Zwelithini … its no surprise the #Mfecane is revived as #Xenophobia ? Similarly, on Instagram, broad searches for the same hashtags return a variety of images, from Zulu speakers in traditional garb to students in the U.S. and Europe studying Zulu in classrooms and other settings to completely random images with zero to no context. When more specific search terms, for example “#amasiko (culture)”, returns much more specialized images directly related to Zulu cultural identity. The difficulty in analyzing social media contributions necessitates questions about the kind of virtual communication occurring that the public is not privy too. As Mark Hunter showed in his research into the HIV/AIDS epidemic in Mandeni, text messages offer new venues for understanding the dynamics of relationship, particularly the “fleeting nature of love: that love proposals can be quick, replies brash, and unwanted contacts immediately deleted.” What kind of discourse about Zuluness is happening away from the public sphere? How can these conversations be recovered for the benefit of future researchers? Analyzing Zulu identity on social media requires this specificity, given the huge amount of content produced on a daily basis, That being said, however, by strategically analyzing the habits of specific figures and organizations, in this case Songezo Zibi of Business Day and Ukhozi FM, it is possible to draw some conclusions that might hold insights for broader understandings of how and why Zulu is used on social media. Songezo Zibi, editor of Business Day South Africa, is an interesting case study for analyzing Zulu identity construction on social media, if only due to his code-switching habits. As the editor of a major publication, Zibi often uses Twitter as a forum to discuss pieces published in his magazine, as well as major news stories in South Africa more generally. These tweets are written mainly in English. Zibi switches to Zulu on a fairly regular basis, mainly when he communicates with his followers and commenters on his tweets. But why are we still describing people as "a Zulu man"? Whether this code-switching is conscious on Zibi’s part, or just a natural part of how he communicated Shahrzad Mahootian has found that, “there are a variety of reasons for code-switching, only some of which can be termed socially meaningful, conscious choices.” Whether on a conscious or unconscious level, however, Mahootian argues that switching can be used “consciously to evoke a sense of cultural identity, unity and camaraderie. Here it is used as a direct and undeniable assertion of the bilingual identity.” This choice to consciously switch from English to, in Zibi’s example, Zulu potentially provides “a way for speakers to underscore their ethnicity, their connection to their heritage and to others who share that heritage and the values associated with it, within the majority culture and language.” Zibi’s tweeting “habits” can be compared with those of Ukhozi FM (@ukhozifm), the radio station mentioned in the previous section, tweets predominantly in Zulu. It makes sense for Ukhozi FM to make this strategic choice to communicate with its followers (and listeners) in Zulu, since they also broadcast mainly in Zulu (though with the typical mix of English and Zulu that characterizes communication in South Africa). There is less code-switching in the case of Ukhozi FM because it is useful neither to their brand or their goals as the main Zulu radio broadcaster in the country. In both of these cases, the use of Zulu language represents a strategic branding choice, as a way to connect with potential customers. Another fascinating case study of the use of Zulu as a brand to be marketed to followers is found in Mike Maphoto’s Diary of a Zulu Girl blog. Originally launched in 2013, this blog serves as the platform for the regular publishing of chapters from Maphoto’s digital novella that chronicles the life of Thandeka, a rural Zulu girl from Mooi River who moves to Johannesburg. The stories are written in English, but are riddled with references to Zulu language, culture and history, including references to Shaka, umemulo (coming of age ceremony), and Zulu cultural norms. While the chapters are brief and often filled with errors, the stories have engaged a national and international readership. In a TedxSoweto talk in 2013, Maphoto reported that his site had 33 million hits, over 100,000 Facebook fans, and that his second highest readership (following South Africa, of course) was based in England. Why might that be? Perhaps it’s due to the global migration of Zulu-speaking people. It could also be due to the universal nature of his stories, as Maphoto argues. The answer is unclear, but what is clear is that this story has attracted an audience that is digesting and discussing aspects of Zulu life and culture, far beyond the physical boundaries of the KwaZulu-Natal provincial boundaries. More interesting is the fact that this brand of Zulu is being pushed by a Pedi man from Polokwane, who has developed not only a blog but is also in the process of writing a television series based on the life and culture of a Zulu-speaking young woman. “Our identities are formed in a kind of dialogue with others,” Megan Jones and Jacob Dlamini noted in the introduction to Categories of Persons (2013). The digital revolution has shifted not only the form, but also the content of the dialogues that are forming Zuluness in the 21st century. The content has shifted not simply because of the new forums for the exchange of ideas, but because of the democratizing nature of the mediums through which Zulu-speakers (and, really, all Internet users) are engaging with one another. “The Internet,” Ronald Niezen notes, “has already made it more possible to express abstract identity attachments at both ends of a spectrum: as a source of global identification between peoples who see themselves as suffering from the same leveling powers of state governments, international agencies and private organizations; and as a local source of cultural reawakening and boundary reinforcement, a community based answer to the effects of cultural disembodiment and dissolution.” Though Niezen’s reflections focus on his experiences in studying the Indigenous Peoples Movement, the same recognition of the Internet’s power in shifting the course of debate is applicable in the Zulu example. Though it is easy to overstate the democratizing effect of the Internet, especially given the disparities in access to both connectivity and technology in KwaZulu-Natal and South Africa as a whole, there is no doubt that the digital realm has opened new spaces for debates over Zulu-ness to a broader constituency than had previously determined both the direction and content of these contestations. Historians must take these shifts into consideration in their understanding of the contemporary “imagined community” of ubuZulu bethu in the analog and digital realms. Benedict Anderson, Imagined Communities (New York: Verso, 2006): 6. Katerina Diamandiki, “Virtual ethnicity and digital diasporas: Identity construction in cyberspace,” Global Media Journal 2, 2 (2003). Kathryn Pentecost, “Imagined Communities in Cyberspace.” Social Alternatives 30, 2 (2011): 46. Mary Chayko, “Techno-social Life: The Internet, Digital Technology, and Social Connectedness.” Sociology Compass 8/7 (2014): 978. Mark Poster “Virtual Ethnicity: Tribal Identity in an Age of Global Communications,” in S. Jones (ed.) New Media Cultures: Cybersociety 2.0: Revisiting computer-mediated communication and community. (Thousand Oaks, CA: Sage Publications, 1998): 184-212.
and Present (Pietermaritzburg: University of KwaZulu-Natal Press, 2008). Michael Mahoney, The Other Zulus: The Spread of Zulu Ethnicity in Colonial South Africa (Durham: Duke University Press, 2012): 150. Liz Gunner, “Resistant Medium: The Voices of Zulu Radio Drama in the 1970s.” Theatre Research International 27, 3 (2002): 262; see also Liz Gunner, Dina Ligaga, and Dumisani Moyo. Radio in Africa: Publics, Cultures, Communities. (Johannesburg: Wits University Press, 2011). Ngugi wa Thiong’o. Decolonising the Mind (Portsmouth: Heinemann, 1981): 13. Mark Turin, “Our Language In Your Hands: South Africa,” BBC4, 10 December 2012. Accessed 2 May 2015, http://www.bbc.co.uk/programmes/b01p6zt6. Jacob Dlamini, Native Nostalgia (Johannesburg: Jacana, 2012): 139-140. “Zulu Gets Technical,” SA People News, 13 February 2013. Online Article. Accessed 2 May 2015, http://www. sapeople.com/2013/02/13/zulu-gets-technical-388/. “Zulu Goes High-Tech.” Times Live, 9 February 2013. Accessed 2 May 2015, http://www.timeslive.co.za/ scitech/2013/02/09/zulu-goes-high-tech. Aisha Abdool Karim, “Zulu Gets Creative,” The Varsity, 12 March 2013. Accessed 2 May 2015, http://varsity newspaper.co.za/features/1399-zulu-gets-creative. Tarryn Giebelmann, “Technology ‘Zulufied’” IT Web, 23 April 2013. Accessed 2 May 2015, http://www.itweb.co.za/ index.php?option=com_content&view=article&id=63485. Nokuthula Ntuli, “Interest in New Zulu Bible Grows,” The Mercury, 7 January 2015. Online. Accessed 2 May 2015, http://www.iol.co.za/mercury/interest-in-new-zulu-bible-grows-1.1802210#.VUGFFq1Viko. African and Asian Studies 1, 4(2002): 311; 317. “About,” Isizulu.net, Accessed 2 May 2015, https://isizulu.net/about/. “Free Online Course.” Accessed 2 May 2015, http://www.unisa.ac.za/free_online_course/. “Google Translate—Now in 80 Languages,” Google Translate Blog, 10 December 2013. Accessed 2 May 2015, http://googletranslate.blogspot.tw/2013/12/google-translate-now-in-80-languages.html; “Gmail Now Offers 71 Languages, From Afrikaans to Zulu,” Global Voices, 9 July 2014. Accessed 2 May 2015, https://globalvoicesonline.org/ 2014/07/09/gmail-adds-13-languages. “Phasile, feyilile? Google’s Zulu translator tested,” htxt.Africa, 12 December 2013. Accessed 2 May 2015, http://www. htxt.co.za/2013/12/12/phasile-feyilile-googles-zulu-translator-tested/. Johann du Toit, “Zulu on the Net,” 28 December 2014. Accessed 2 May 2015, http://johanndutoit.net/zulu-on-the-net/. Rebecca Kahn and Simon Tanner. “Building Futures: The Role of Digital Collections in Shaping National Identity in Africa,” in African Studies in the Digital Age: DisConnects?, edited by Terry Barringer and Marion Wallace (London: Brill, 2014): 125. Ronald Niezen, “Digital Identity: The Construction of Virtual Selfhood in the Indigenous Peoples’ Movement,” Comparative Studies in Society and History 47, 3 (2005): 537. Elizabeth Greyling and Niall McNulty. “How to build an Indigenous Digital Library through Community Participation: the case of the Ulwazi Programme.” Conference paper presented at Information for Sustainable Development in a Digital Environment, SCECSAL (2012). Niall McNulty and Grant McNulty. Digital Memory Toolkit. (McNulty Consulting, 2014): 5. Niall Firth, “Tablet PCS Preserve Indigenous Knowledge.” The New Scientist. 18 June 2012. Accessed April 27 2015, http://www.newscientist.com/article/mg21428696.400-tablet-pcs- preserve-indigenous-knowledge.html#.VT5UGq1Viko. Grant McNulty, “Digitisation and Democracy,” Archival Platform, Accessed 27 April 2015, http://www.archival platform.org/blog/entry/digitisation_and_democracy/. Niall McNulty, “The Ulwazi Programme: A Case Study in Community-Focused Indigenous Knowledge Management.” In Knowledge Management for Development K. Osei-Bryson, G. Mansingh and L. Rao, Eds. (New York: Springer, 2014): 227. Anatoliy Gruzd, Barry Wellman, and Yuri Takhteyev, “Imagining Twitter as an Imagined Community,” American Behavioral Scientist 55, 10 (2011): 1313. Androniki Kavoura, “Social media, online imagined communities and communication research”, Library Review 63, 6/7 (2014): 494. “About,” Africa Is a Country. Accessed 2 May 2015, http://africasacountry.com/about/. Portland Communications, “How Africa Tweets 2014.” Accessed 28 April 2015, http://www.portland-communications.com/publications/how-africa-tweets-2014/; Rahim Kanani, “New Research Reveals How Africa Tweets,” Forbes 23 April 2014, accessed 28 April 2015, http://www.forbes.com/sites/rahimkanani/2014/04/23/new-research-reveals-how-africa-tweets/. Inkosi Tilongo Foundation. Facebook Page. Accessed 2 May 2015, https://www.facebook.com/pages/Inkosi-Tilongo-Foundation/112801565471047?fref=ts. Siyabonga Mkhize. “Finding our Mkhize Past,” The Archival Platform, 22 June 2010. Accessed 2 May 2015, http://www.archivalplatform.org/blog/entry/finding_our/. Grant McNulty, “Tradition, Custom and Political Power in eThekwini, KZN,” Archival Platform, accessed 25 March 2015, http://www.archivalplatform.org/blog/entry/ tradition_ custom/blog. Mark Hunter, Love in the Time of AIDS (Bloomington: Indiana University Press, 2010): 182. Public figures are the main focus of this analysis due to concerns over permissions and fair use. Though Twitter is an open forum and you can pull tweets from virtually anyone, I chose to only public figures for deep analysis to avoid any ethical issues. In the future, I may develop this paper and consider using a broader selection in order to draw broader conclusions. Shahrzad Mahootian, Linguistic Change and Social Meaning: Codeswitching in the Media. International Journal of Bilingualism 9 (2005): 363. Jeanette Chabalala, “The Interview: Diary of a Zulu Girl’s Mika Maphoto,” News24, 25 November 2013. Accessed 2 May 2015, http://www.news24.com/Archives/City-Press/The-Interview-Diary-of-a-Zulu-Girls-Mike-Maphoto-20150429. Megan Jones and Jacob Dlamini, “Introduction,” in Categories of Persons: Rethinking Ourselves and Others, ed. by Megan Jones and Jacob Dlamini (New York: Picador, 2013). E-book.